As soon as I saw the package of shaved brussels sprouts at Trader Joe’s I knew I wanted to try something fun with them. My first thought was to substitute them for spinach in a dip, but since every time I bought a bag, it went bad before I could make one, I took it as a sign it wasn’t meant to be. This shaved brussels sprouts and pomegranate tricolor quinoa is so versatile, and is perfect for a fall dinner party, or your Thanksgiving meal. It’s a great main dish for vegetarians and vegans, and makes a nice side for the meat-eaters at the table. It’s also gluten-free, and packed with protein because of the quinoa. You can serve it on it’s own or over cubes of roasted butternut squash. Tricolor quinoa can be slightly more expensive than regular quinoa, but it’s totally worth it, because it gives a dish an added depth of flavor and texture. This dish lends itself to a good amount of personalization. I like it with a few sprinkles of a finishing salt, such as a pink himalayan, but you can also add a few pinches of dill on top before you serve it. 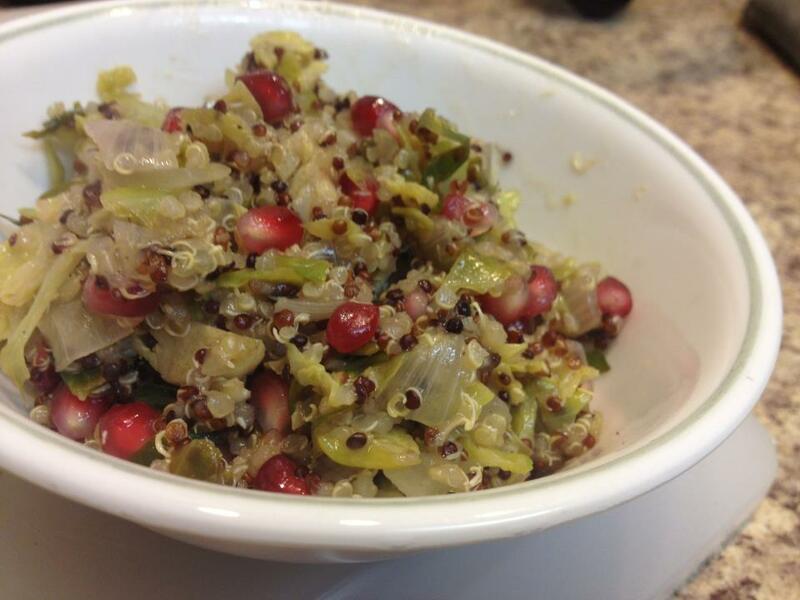 If you prefer a sweeter dish, add about a teaspoon of sugar after you add the brussels sprouts and before the quinoa. It will bring out the bussels sprouts flavor a little more, esxpecially if you happen to get a bag that is a little bit on the bitter side. In a pot, combine the quinoa, water and Better Than Bouillon, and bring to a boil. Reduce to a simmer and cook for about 15 minutes, or until most of the water is absorbed. Carefully sort through the shaved brussels sprouts, checking for any large pieces. Remove, and chop into smaller pieces. Heat a tablespoon of olive oil in a pan. Add the onion and cook for about two minutes just until they start to become soft. Add the brussels sprouts, wine and season with a few sprinkles of sea salt and pepper. Cover and cook over medium heat for a few minutes, making sure not to let them burn. Once the brussels sprouts are wilted, add the quinoa and cook for another 2-3 minutes until most of the liquid in the pan gone. Carefully fold in the pomegranate seeds until they are evenly distributed. The seeds should be warm, but not cooked. Next Post Garden Sprouts … In November! Thank you for pointing that out! I updated the recipe. It's added just after the brussels sprouts to help them steam.